There’s an old saying in the journalism community: If your mother says she loves you, check it out. Taken at face value, this would seem to be a strange claim. Today the Navy has a fleet of 288 deployable battle force ships. How would an already stretched Navy muster 12 percent of the fleet to provide security in Mumbai? And which aircraft carrier are they sending to patrol the sea lanes in Mumbai? The Abraham Lincoln and the Harry S. Truman, the two carriers in the area, are both supporting the war in Afghanistan and maritime security operations right now. Breaking off Lincoln to patrol near India isn’t out of the realm of possibility but it seems unlikely. A little more perspective: A typical carrier strike group comprises a carrier, a cruiser, and a couple destroyers. And that’s considered a lot of sea power. (Some might even say it’s power unlimited.) The massive RIMPAC exercise earlier this year managed to muster 40 ships, but they were from seven nations. In fact, 34 would be just shy of half the number of warships, excluding patrol craft and auxiliary ships, used during the invasion of Iraq. Navy policy prohibits the service from commenting on presidential security arrangements. But a source within the Defense Department questioned the report, calling it “inaccurate,” and indicated the number was inflated. There you have it, the story isn’t true. Calm down, people. Now, if you take into account that the Indian coast guard will undoubtedly be patrolling Mumbai’s harbor at a heightened state of readiness, then you will probably have more than 34 vessels pulling security. But the idea of the Navy sending 34 ships is, frankly, absurd. The uproar comes on the heels of unsubstantiated and flimsy reports that the president’s upcoming 10-day trip to Asia would cost taxpayers $200 million per day. Navy Times’ inimitable news editor Jenn Rafael points out Obama’s trip would then cost about as much as a Virginia-class submarine. The White House says those reports are also wildly inaccurate. USA Today’s “Oval” blog also put some AFFF on those flames. Read that take here. By all means, take USA Today as the definitive word. 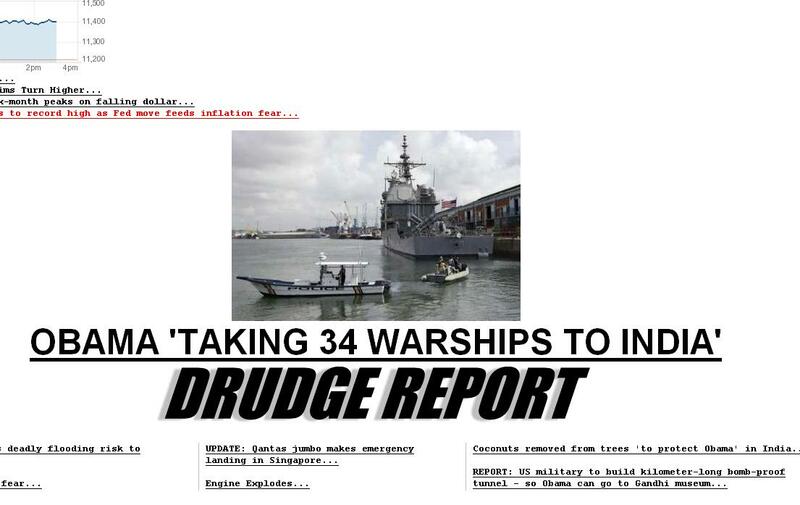 Drudge never said 34 ships were all U.S. Navy. I know Obama needs all the help he can get but from Navy Times? One uninformed Indian media outlet publishes BS information and some people will jump on it and run. Nature of the Beast of Modern Technology. I worked in, with and for the White House Advance Office in the Bush (43) Administration and for the Office of the First Lady over most of their 8 years in the White House, I can attest that trips like the one Obama is taking to India are ridculously expensive, planes, cars, USSS staff, military support staff, WH staff (the press pays for itself BTW), but all the reports around this trip are off by an oder of madnitude, like mixing up Million, Billion and Trillion. That said even though the cost is no where near what a Virginia class submarine costs I would NOT be surprised to find the total cost was something very close to what a new LCS costs. If that’s not U.S. Navy, whose warships would Obama be taking?